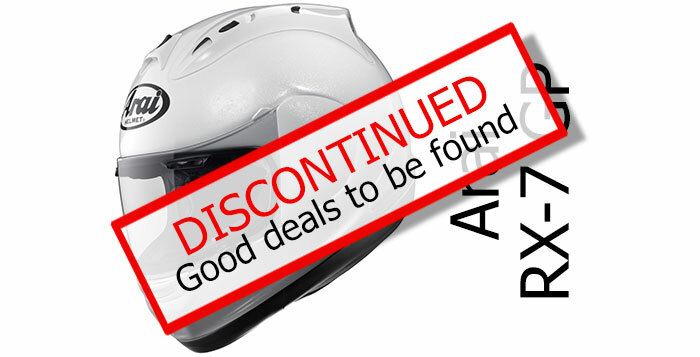 4 Looking to buy an Arai? 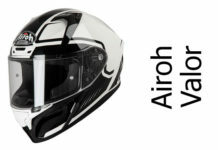 11 Best places to buy an Arai crash helmet? 12 Definitely want an Arai? The Arai RX-7 is a damn good helmet. While not the most recent helmet in our crash helmets for sale section, that does mean it has been widely tested and reviewed and it is almost universally seen as one of the best helmets on the market. It’s also one of the first helmets to meet the US Snell M2010 safety standards. The build quality is second to none, the visor size, fit and ventilation are all very good. Comfort is also reported as excellent. The only slight hiccup is the missing star in the Sharp rating meaning it ‘only’ scores four out of five. The RX-7 has been given a 4 star Sharp rating in the UK – the maximum is 5. Front & rear safety were rated as very good with side impact test rated as above average (but which appears to have lost it the fifth star). Having said that, Arai’s are widely regarded as one of the best constructed helmets around and are used by some of the highest profile motorcycle and F1 racers in the world. It’s also worth noting that the RX-7 uses a variable thickness shell with a thicker shell in parts which are prone to taking heavy impacts in an accident and thinner shell in parts which typically don’t (including around the ears). Which will keep the weight down but may have also, inadvertently, lost it that extra star. 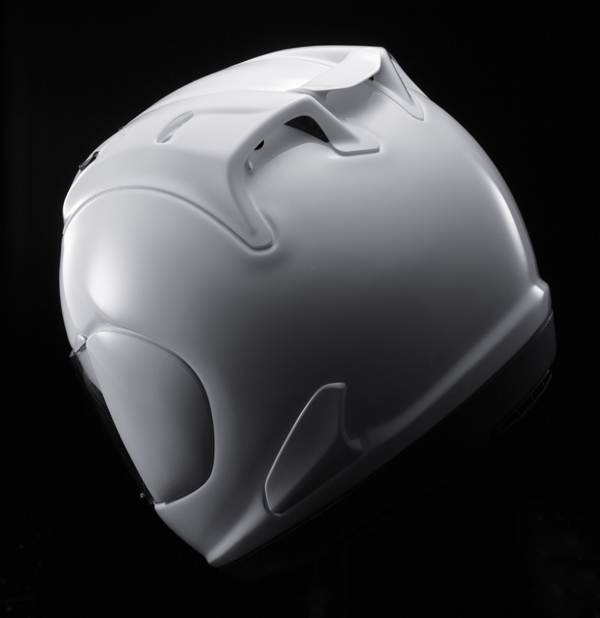 The Arai bumf states that it uses a peripheral strengthening belt as used in their Formula One helmets. Also has quick release cheek pads to make the helmet easier to remove if you do have an accident. Looking to buy an Arai? We recommend Sportsbikeshop (UK) or GetGeared (UK) for outstanding service and free helmet delivery (UK), or Motoin (Ger) for quality service and decent prices (even with the current £-€ exchange rate). Please click any link to see their full range and latest prices. No problems reported. Arais are generally quiet and the aerodynamic shape of the RX-7 with its adjustable rear ‘Air Wing’ spoiler contributes to the lack of noise. Nothing to worry about here. Arai say they use more outer helmet shell sizes that any other manufacturer. Which means that where some manufacturers will produce one external shell size covering XXL, XL & L and another for M, S & XS, varying the internal size by using more or less padding internal, Aria use up to 5 external shell sizes for some models. This is important for two reasons. Firstly, it’s the internal padding that is critical in shock absorbing much of an impact and in ensuring a correct fit to the head – again key to safety. Secondly, and of critical importance, it ensures your helmet is in proportion to your body so don’t look like you have a giant head wobbling on the top of tiny shoulders! The RX-7 has chin and three forehead vents which are particularly good at keeping the head cool and the visor mist free. Users also report that all vents are very easy to operate – even with gloved hands on the bike. Coupled with an anti-mist visor and tight visor seal, the venting system is regarded as top notch. All day comfortable although, as always, that’s as long as you have an Arai-shaped head. However, because Arai use more helmet shell sizes than many other manufacturers, this does mean you generally have the correct amount of internal shock absorbing material and a higher chance of getting the right sort of fit (i.e. not too tight or too loose) which in turn means that if you’ve tried on an Arai, found it fits nicely, then you’ll generally be happier in it for longer. Larger aperture (5mm larger) than its predecessor means better peripheral vision. Comes with anti-fog visor as standard which, coupled with excellent ventilation, is one of the best fog-free systems. Also comes with silicone gel to keep the visor/rubber seal lubricated to maintain the seal. For other Arai helmets, see also our review on the Arai Tour X3. For other helmet reviews check out either our Crash Helmet Reviews or SHARP 4 & 5 Star Motorcycle Helmet reviews sections! And if you’ve ever worn an Arai RX7 GP please comment below and let us all know what you think. Thanks! Best places to buy an Arai crash helmet? We've chosen some of the best places to buy from - whether it's an Arai or any other helmet/gear. If you want piece of mind when you buy, SportsBikeShop are based in the UK and offer outstanding service (9.8/10 on Trustpilot at the time of writing) and 365 day refunds. They have some of the most competitive prices around and are our recommended retailer for quality of service too. Motoin have decent € prices and give great service (4.8 on eTrusted Shops at the time of writing) - and they're based in Germany. Note if you buy from Motoin you'll have to add shipping charges on top if you're outside Germany. GetGeared are another recommended UK retailer, with a no-quibble 365 day returns policy and scoring (at the time of writing) 8.9/10 on Trustpilot. Please click any picture below to visit their Arai helmets page where you can see all the latest deals and designs. And if you buy from any, we get a small sum from the sale at no extra cost to you - a massive THANKS! (it's how we finance the site). A superb full face helmet that performs well in every way. It's let down only because it's so expensive. But if price isn't a problem, then you'll both be happy together. If it is, then there's better value to be found elsewhere.